Digital Worldwide Radio | BUDK.com - Knives & Swords At The Lowest Prices! 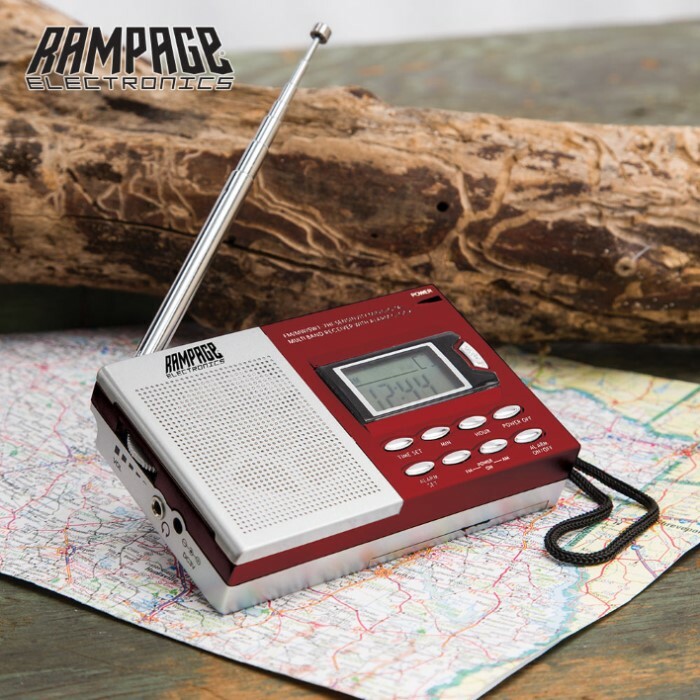 Approximately 4 3/8" x 2 3/4" x 1"
The Digital Worldwide Radio is great to take with you when traveling or camping. It is a 9-band AM/FM shortwave radio that has an easy-to-read illuminated LCD display. It has an extendable antenna and a hand strap for easy carry. It can also be used as an alarm clock. It's a great little digital radio with a low price and high value! 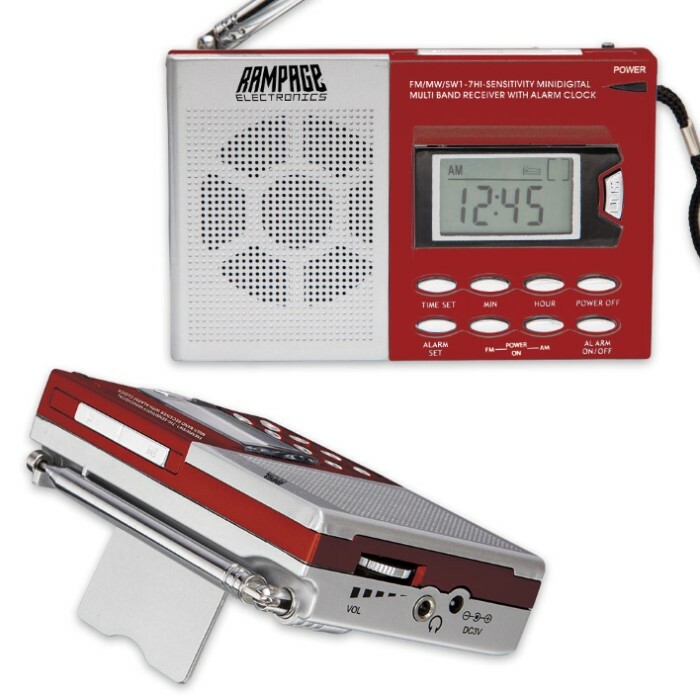 I bought two of these radios, I was so impressed that I gave the second away as a gift and now I plan to order several more. The sound is great for a small radio, no "tinny" sound as I'd expected. The controls are great, nice and positive, and it's simple to operate. The shortwave feature is fun to mess with and the other bands pull in stations very well, also. I plan on giving the radio more of a test this Summer , but, for now I'm extremely pleased..a very, good purchase for the price! I bought this radio to listen to in my work area it is very small but works good I would have liked getting a DC cord with it but its battery operated. 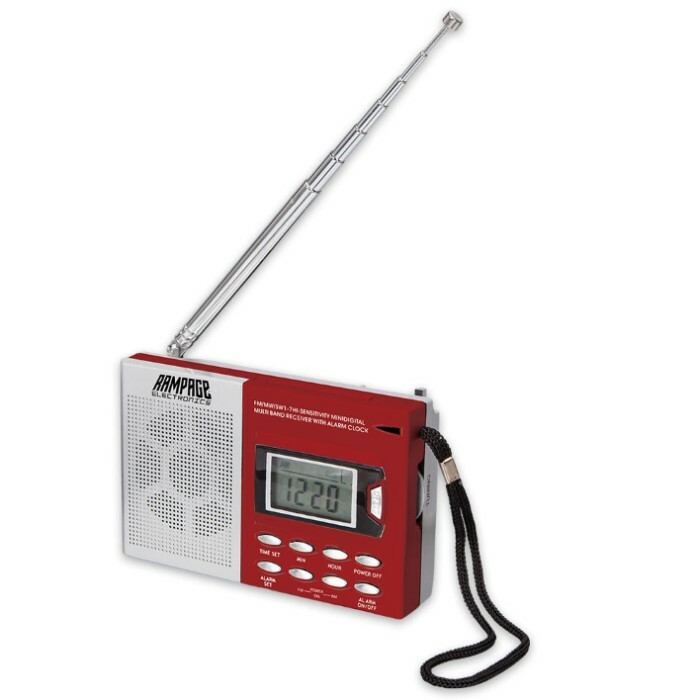 I recently purchased 2 of these small AM/FM radios and I am very satisfied with it. I bought the second because I believe that if you buy something and you really love it, and then it is no longer available, you will say, "I wish I had bought 2 of them!!" For the very reasonable price per radio, I knew I could not go wrong buying a second one. It fits in my shirt or jacket pocket, takes very little space on my office desk or in the kitchen when having my morning coffee. The quality is very good for an inexpensive radio and it is sturdy plastic as well. I highly recommend it as a portable radio to take anywhere or leave right on you desk or bedroom end table. Small lil radio. Big sound. Use it when I am mowing yard. (need ear phones). Fits in shirt pocket. Well worth the money. Small in size. Big in performance. This radio may not be an eye catcher, but it performs very well. The small tuner takes a little little practice......it does pick up a number of signals.....but it is worth every penny. The box it is in will hold extra batteries. The digital clock, with alarm function, is a big plus for travel. I have been an amateur radio operator for over 20 years and a radio hobbyist for over 40 years. So, you can believe me that this is quite a good radio for its size and price. I was able to receive WWV on 10 mhz during daylight hours on just the whip antenna and my favorite FM station which is fairly weak with ease. This radio is small enough to put in most shirt pockets and works ! I like this radio and intend to get another.